This 33 year old male patient initiated d4T/3TC/EFV in March 2008 with baseline CD4+ cell count 34 cells/ul and clinical stage 3 (pulmonary TB). He admits to having had adherence problems early on due to concerns about taking TB therapy at the same time as ART he was poorly informed about the need for combined TB treatment and ART. He reports that, as a result, he did not take ART reliably until July 2009. His results show that, despite some immunological recovery, he has persistent high-level viraemia. Adherence to clinic visits is now excellent and adherence to ART is assessed as very good using the tools in the South African national ART guidelines (>95%). He is now well informed and self-motivated without any obvious barriers to adherence. In terms of adverse drug effects, he has only evidence of mild lipodystrophy (not noticed by patient himself). The patient has never had a viral load <1000 copies/ml and indeed the viral load has steadily increased since July 2009 despite supposed good adherence to ART. Resistance genotype: This individual has developed M184V and K65R but also the Q151M complex (consisting of Q151M mutation with V75I, F77L, F116Y) which together will confer high-level resistance to all NRTI/NtRTIs. In addition the common NNRTI mutation K103N mutation is present accompanied by P225H, which increases EFV resistance. Treatment recommendation: This is a very difficult case. Since the patient has high-level resistance to the entire NRTI class, options for second-line therapy are really limited. A standard second-line regimen would effectively be lopinavir/ritonavir monotherapy, which might have some efficacy but is unlikely to lead to durable virological suppression. Ideally one would like to construct a new regimen consisting of lopinavir/ritonavir and lamivudine combined with two novel agents raltegravir and etravirine (GSS 2.5). If neither raltegravir or etravirine are available, another option would be a double boosted protease inhibitor regimen, e.g. lopinavir/ritonavir + atazanavir, although the long-term efficacy of such regimens is also doubtful. Adherence: Intensive adherence support is needed regardless of the regimen selected. It is important that the patient and his treatment supporter are both educated and informed fully about the new regimen and the importance of adherence. General comments: It is important to screen comprehensively for TB disease, given the persistent low CD4+ cell count and past history of TB. TB therapy might impact on the dose of second-line ART (certainly the dose of lopinavir/ritonavir and possibly also raltegravir). I.  What is the Q151M complex and how does it develop? II. Is there any evidence for the effectiveness of LPV/r monotherapy in second-line therapy in resource-limited settings? I.  The Q151M mutation is selected by NRTI therapy and, on its own, confers intermediate resistance to ZDV, d4T ddI and ABC. When Q151M is accompanied by mutations at codon 75,77 and 116 (Q151M complex) then this complex confers high-level resistance to these NRTIs plus intermediate resistance to 3TC and TDF. Selection of the Q151M complex seems to be related to the duration of NRTI treatment and so far the reported prevalence in patients failing first-line ART in Southern Africa is low. It is noteworthy, however, that one cross-sectional study of patients failing first-line ART in Malawi, where routine virological monitoring is not performed, reported an extremely high prevalence of Q151M complex (19.1%). II. There is some preliminary data that LPV/r monotherapy leads to potent virological suppression in the short term. Longer term data is awaited from this study and from Randomized Control Trials. LPV/r monotherapy currently seems best suited in patients where simplification of regimen is required after virological suppression had already been achieved. I. 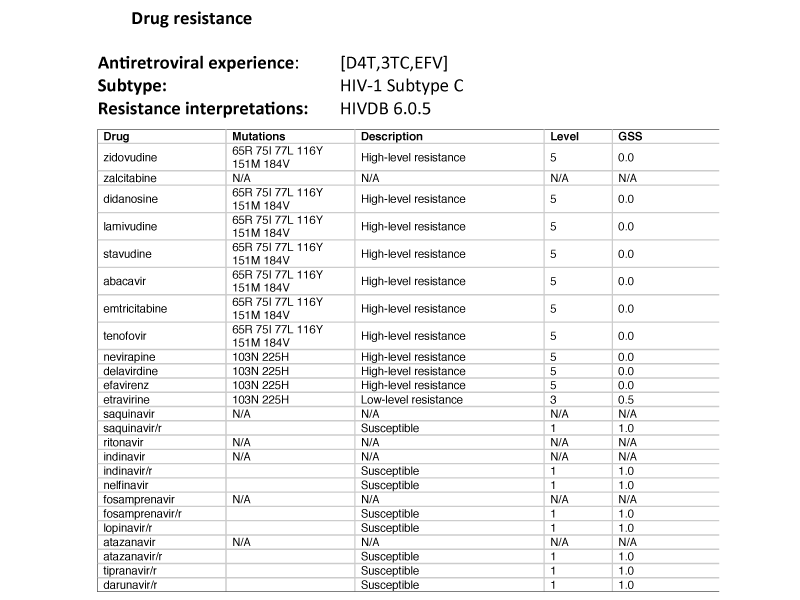 The Q151M complex is uncommon but it confers high-level resistance to almost all NRTIs. When present with the K65R and M184V mutations, there will be high-level resistance to the entire NRTI class.